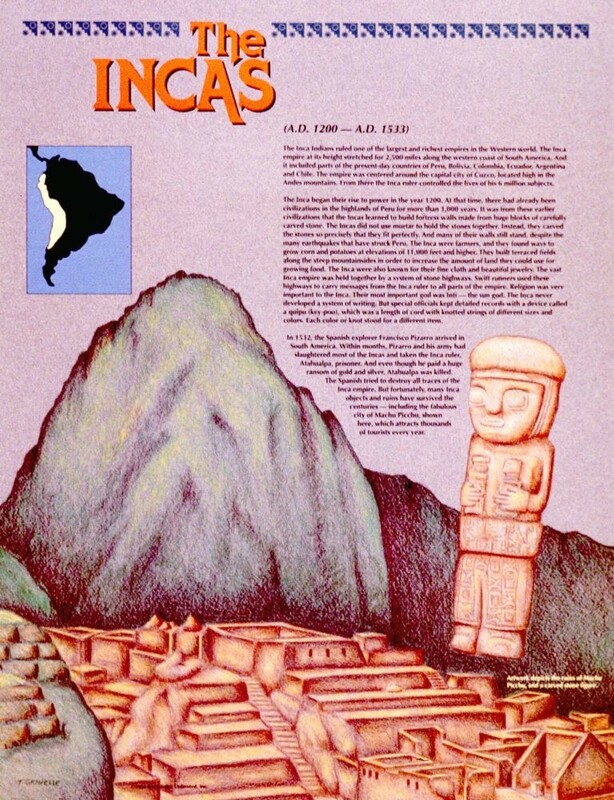 This educational poster features artistic renderings of the renowned Incan city of Machu Picchu, as well as a carved stone artifact from the Incan civilization. It also contains a well-explained and concise background history of the Incas,and a small map showing where the civilizations was centered. 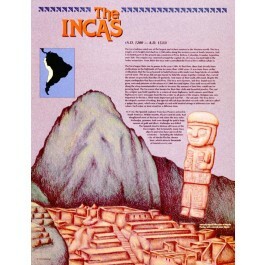 From about 1200 A.D. to 1533 A.D., the Inca Indians ruled one of the largest and richest empires in the Western world. They were known for their advanced farming techniques and built elaborate terraced fields along the steep mountainsides. Although they and their civilization were virtually destroyed by the Spanish explorers, their genius is still on display today in the splendid remains of the city of Machu Picchu.